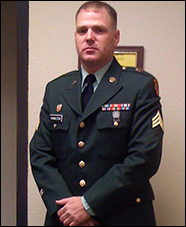 Army Sergeant Joshua Hamilton joined the military on February 1, 2005 out of Lewisville, Texas. He cites following family footsteps and serving his country to the best of his ability as reasons for joining the Army. He served in the Army for over five years. In July of 2007, Army Sergeant Joshua Hamilton was injured after enduring multiple explosions in Taji, Iraq. The blast radius from a Vehicle Borne Improvised Explosive Device resulted in Sergeant Hamilton being thrown against a wall. He awakened to light fragments in his eyes and ringing in his ears. Days later, a mortar landed approximately 50 feet from a bunker door. From that point forward, Sergeant Hamilton started to suffer from extreme migraines and the onset of memory loss. He suffers from Cervical spondylosis, a right knee ACL tear, left eye optic nerve pallor, right shoulder tendinitis, tinnitus, traumatic brain injury, and Posttraumatic stress disorder (PTSD). Among the commendations awarded to Sergeant Hamilton were the Iraq Campaign Medal with two campaign stars, Army Commendation Medal (3x), Army Good Conduct Medal, Global War on Terrorism Service Medal, Non-Commissioned Officer Professional Development Ribbon, Overseas Service Ribbon, and Marksmanship Qual Badge-Marksman with Rifle. Sergeant Hamilton and family received a home in Pensacola, Florida.